Hello and welcome to the first day of the second pre-season test of 2015. 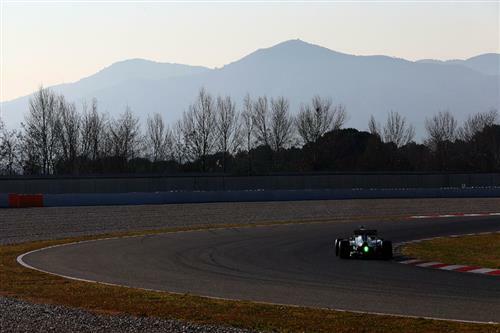 Two weeks after the last test in Jerez, the F1 teams have decamped to Barcelona for another four days of track action. Hi Nate...Any one on track at the moment ?? @AM: Ricciardo has just re-emerged after a long spell in the garage. Wehrlein is out there too. 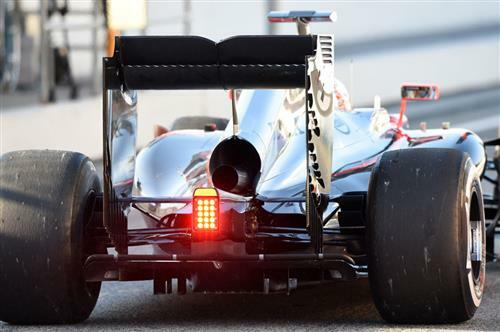 A look at the rear of the McLaren. Not the extra cooling around the exhaust - this might be tightened up later in the season, but is also for the MP4-30's cooling layout. A good view of the slats and louvres in the rear wing endplates. Ricciardo jumps to second with just his second lap, posting a 1:27.541, as he sets about making up for lost time. And now for a more scenic view of the Circuit de Catalunya in Montmelo. Werhlein has to use a green rain light to note his rookie status - it will be interesting to see if they change the one on the Mercedes when he swaps cars later today. Hi nate , any devlopments on Mclaren_Honda trying to run marussia as sister car? @Tech_Savy: There were rumours Honda might buy Marussia as a B-team but they were well wide of the mark. It has yet to be confirmed which engine Marussia intend to use if they are successful in returning - but it won't be a McLaren customer car as that is against the rules. do we have official lunch time? @MMimmyyo: Yes we do! It's at 13:00 local time and Nate is going to sample Mercedes' fine offerings for the first time. He's very excited (and rightly so). Is Torro Rosso still running the 2014 renault engine? We're about half an hour away from lunch, and it's the two men making up for lost time - Ricciardo and Maldonado - out on track. @Brouwer: Not that I'm aware of. It would be an odd thing to do as Renault needs all the mileage it can get. 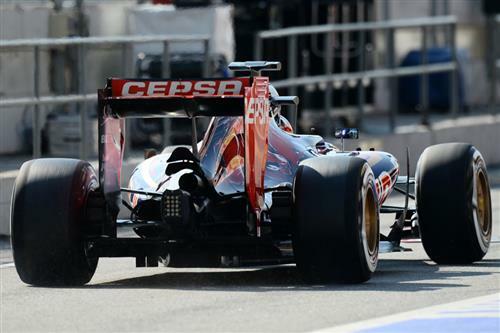 However, the Toro Rosso does have more ample cooling than the Red Bull, if that's what you are driving at? Never cared much for size zeroes. I'll take the curvy Italian. Unless it's this Italian you're after? @grahamg: Not a huge amount, no. Over the course of the next four days it should get a lot quicker (barring any rain storms). It's then only a three day break before the final test when the track should ramp up even more. If they run the 2015 engine it's odd then that they have good speed and no problems. Red Bull seems to have a lot of problems. @Brouwer: I see your reasoning, but it's also about engine installation. The Red Bull is very tightly packaged and has very small sidepod openings for the radiators whereas the Toro Rosso is running the same cooling requirements as it had for last year's engine. As usual, Red Bull are trying to get every last bit of performance it can from its package. Compared to the others, the Merc's nose look very simplistic and rough. Maybe it's not the final one? @CrM: A lot of development parts will come to the Mercedes over these two tests. However, it is still a pretty impressive piece of kit when you get up close. That nose is one of the shortest and most slender I've seen (not easy to pass the crash test) and the rear has some very fine detailing. The wings in Jerez were very similar to last year but they will be updated. Wolff continues to accumulate miles, she's just crossed for her 72nd of the day. The Williams is the only car currently out on track. Confusingly we now have two Wehrlein's on the timing screen, which can only mean one thing - the German has started his shift at Mercedes after taking over from the poorly Hamilton. @CrM: Most cars run them. It's a bit of a loophole in the regulations but allows teams to get a bit more rear downforce. I would say Mercedes' one looks like one of the most developed on the grid - it's certainly pretty complex. @GusCameron: You're not alone in thinking that. Overall our feedback from readers was negative towards the plans to prevent drivers changing helmets. When we will you know the crash test results ? @Tungath: All the cars out there have passed their crash tests. They wouldn't be allowed to run if they hadn't. 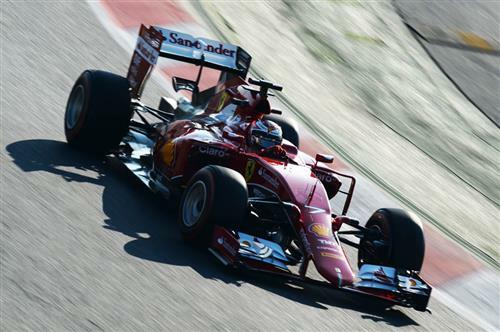 @bitinq: It's an improvement on Jerez, let's put it that way. The team has made clear that it is tracing all the problems it sees appear on the car, but it's often a slow process. They will be hoping for a lot more laps towards the end of this week though. Wehrlein only completes six laps in the Mercedes and returns to the pit lane. It'll be important for the world champions that they get a good afternoon of testing under their belts after Hamilton's stoppage this morning. A problem with the Honda power unit's MGU-K seems to be the issue and an engine change is needed. The chequered flag is out in Barcelona, which signals the start of the one-hour lunch break. Plenty to digest at the McLaren garage I imagine. We've had to stop running today due to a faulty seal on the MGU-K which caused an issue that requires full replacement of the power-unit. Right, we're back. 10 minutes until the start of the afternoon session and another four hours of F1 action. At least that's what we are hoping for. We know for certain we won't see the McLaren again for the rest of the day and Hamilton has left the track ill.
What kind of wine did you pair with your seal cutlet?